Let’s face it is rare to find a local business that can grow revenue from only word-of-mouth marketing and customer referrals and next to impossible for new businesses to do this making the appropriate investments. The challenge for large and small businesses is how to affordably generate traffic (online or in-store), leads, and sales. Business owners general have two options – make costly investments in expanding your sales and marketing teams or using marketing and advertising to promote your business. When done right advertising and marketing promotion can be one of the most cost effective and efficient ways to accomplish your business and sales objectives. As a general rule of thumb, the average consumer needs to see something at least 10 times before they take a call to action – so diversify your reach by using different media to get in front of your audience. Successful advertising for large and small companies depends on establishing credibility in the marketplace, targeting, and reaching local audiences with relevant messages that build your brand, engage customers and drive traffic to your online or offline business (brick and mortar business) or local event. We start by highlighting advertising options available to local businesses and advertisers, based on our experience of working with thousands of local advertising customers from more than 35 industries. Advertising when used correctly can build your brand, increase revenue, profits, and importantly attract and engage local audiences. The last section is designed for client’s who are serious about growing their businesses sales, increasing attendance at their local events, or expanding their customer base today and want help jump starting these efforts by tapping into real local audiences in local markets. Most local businesses and advertisers start out solid planning and good intentions when approve their annual ad and marketing budgets, allocate their ad spending, and choose their media mix. In the end, however many face budget or resource constraints that force them to select (or favor) one or two media options instead of what they originally wanted leading to mixed results and lower ROIs. We hear it over and over again from clients, we want to do more, but due to funding issues all of our money is going to one medium like radio, TV, print, or out-of-home (OOH) advertising with a only a small portion of their funds being earmarked for internet or social media marketing. In other cases, the business owner or agency recommends 100% of their ad budgets go to online internet or social media marketing efforts, when allocating a more balanced budget between on line and traditional advertising has proven to increase local audience reach significantly. Before you get started, look in the mirror. Have you updated your web site, blog, Facebook or social media pages and are you doing this on a regular basis? Have you optimized your site for search engines like Google and Bing? Do you have referenceable accounts, customer testimonials, and importantly have customers posted reviews on your Google+, Facebook profiles, etc. Brightlocal’s 2017 Local Consumer Review Survey findings highlights the importance of online reviews to reaching and building consumer trust – 85% of consumers trust online reviews as much as personal recommendations. Have you reviewed your followers on social media and removed inactive and dead accounts. Doing all of this will go a long way to build up the awareness of your brand or company with web site social media visitors and help your company be seen as an authority within the industry. Are you continuing to publish great content or writing blogs about your products or business both are important tools to generate organic leads and demonstrate domain expertise. Creating testimonials or experiential videos provide a significant boost to organic reach as well can help you profile your business with local consumers. You can also consider applying for local business awards, winning these awards can boost credibility, and lead to increased sales. Have you cleaned up your database and email lists? It is important to have your house in order before you embark on any advertising campaign. Who are they? What do they do and like? Are they looking for affordable products or services or deals? Certain audiences require different messages – for example educating and nurturing clients require different messages than those who want to buy right now. Defining your target audience is a critical step to developing an effective advertising campaign. If you are targeting senior citizens for example an advertising medium such as Facebook is a poor choice. If you are targeting on-the-go Moms who make healthcare decisions and many parenting decisions outdoor digital billboard advertising is a good option. Once you know your audience you can create relevant content that will help you reach your audience on a personal level. The data is clear successful campaigns require engaging customers through multiple media formats and increases response rates and effectiveness across your media mix. Our team of advertising and marketing specialists discuss the top marketing and advertising ideas and tactics that help local businesses boost revenue and attract new and returning customers below. More consumers are spending more time online, than ever before. A recent study indicated that many mobile phone users are using their phones for 5+ hours per day. So make sure content is informative (includes product and pricing information), list your business on local and relevant websites in your target market, and ensure content is mobile friendly. To increase your reach with local audiences, it is important that you site is listed in and positioned with the most relevant and highly trafficked local directories. Local SEO means you’re optimizing your website for the local web search so that your business shows up in a location-specific query. For example, "billboards near me" or "top blog site in Wichita" would both be considered local searches. Having a relevant local web site with deep content ensures you appear on page one (1) in local searches on Google and Bing. According to Search Engine Watch research, 50 percent of mobile users and 34 percent of tablet or computer users visit a store within a day of their local search. 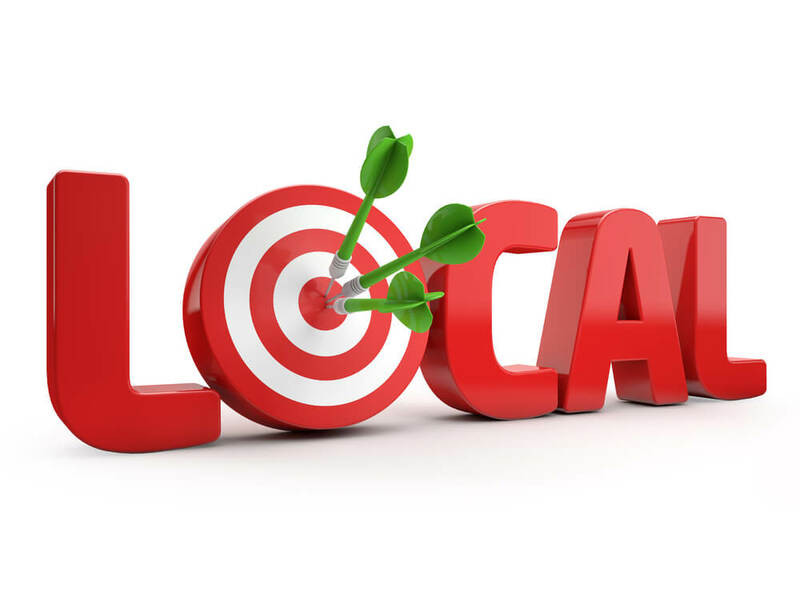 Local SEO optimization can have a significant impact on generating leads and increasing business sales. Take advantage of social media by creating a Facebook page to regularly promote your products and services. It is has become much harder to generate organic reach on Facebook, so to advance your brand you have pay for advertising or partner with a third parties to expand your reach. Facebook remains a great platform to brand, build awareness of your business, attract followers, build fan pages, promote new products or menus or specials and receive reviews, endorsements and feedback from customers. For experienced users, Facebook ad targeting options are great but as more posts crowd news feeds lower percentages of your fans see your updates. Some industry researchers estimate that each Facebook organic post (i.e., unpaid boost or promoted post) is seen by between 10%-15% of your fans (i.e., those who have liked your page or are your followers) – to reach the remaining 85%-90% you need to pay to boost your posts (keep in mind, if you start paying and then stop paying for advertising, Facebook algorithms may assign you to a penalty box for 4-6 months before you see organic growth return). 2017 research by Webbly surveyed 2,600 small business owners and reported that 89% of these businesses think Facebook is a place to been seen but 62% believe their Facebook ads miss their targets. When considering how much to spend on Facebook, Alignable conducted a survey of 1,200 businesses with less than 50 employees and reported that half spent $0 on Facebook advertising and the on average the other ~600 businesses spend between $1-$4 per day (3% of companies surveyed were spending ~$15 per day). Typically Facebook advertisers are spending between 20%-50% of their monthly Google AdWords spend (and keep in mind all of this advertising is prepaid). One of the better and more affordable online advertising options for local businesses is through pay-per-click (PPC) marketing using AdWords or Bing Ads. Businesses can use these platforms to show ads when people search for relevant key words or phrases that you choose and are relevant to your business, products and services. Once you identify the key words and set up campaigns you can set bids for each word and when people search for that word your ad will pop up in the search results. Managing ad words takes daily nurturing and is something that many businesses outsource to local ad or SEO agencies. Because it is easy to use your local competitors can buy, bid on, and target the same key ad words (such as "small business advertising solutions") which ultimately may end up in price wars and increasing your expenses significantly. AdWords and Bing Ads paid search include incredible functionality that includes negative matches, day-parting, geo-targeting, conversion, and analytical tools to help you manage and measure the success of your campaigns. The learning curve for using PPC advertising can be steep and costly for users who do not pay attention or measure the success of this form of advertising. All of AdWords and Bing Ads campaigns require prepayment and budgets vary (pricing is a function of target key words costs, geography, bidding competition and industry). Many local and small businesses spend between $500-$3,000 monthly on PPC advertising. Email marketing is a great way to engage with prospects and maintain relationships with existing customers. The best way to build up your email list is to encourage visitors to sign up for your newsletter and offer something in return to them. However building an email list takes time and its success depends on providing consistent and engaging dialogue. Local advertisers can jump start their email campaigns by tapping into local email lists in their respective markets from third parties, like Wichitaonthecheap, who have built local email list that help target local audiences. Blogging or writing an article is a great way advertise your product or service, boost your company profile and drive traffic to your web site or event, while building your domain authority, trust factor and credibility at the same time. The best thing about blogging or publishing on sites is that many of these sites have already established themselves with their targeted audiences all you have to do is publish a blog or have a blog written about your business or products to access these potential customers. Leading local blogs sites in your community offer a terrific and affordable option and quick way for many advertisers to position your business or local event with existing and relevant local audiences. All three are major social media sites that when regularly utilized can be important ways for you to communicate and link to existing and new users. Sharing experiences, photographs, taking your fans behind the scenes, promoting exclusivity or genuineness, and announcing local or special events on social media platforms are sure fire ways to engage with customers and followers. Twitter allows you to build dialog with users and share and post important information about your business. An important factor in establishing relevance on Twitter is being active on the right #hashtags. Instagram provides a youthful audience and is a very image focused way to promote your business, venue, or products and engage with potential customers. According to some research, Instagram posts see the most engagement when using 10 more hashtags. LinkedIn is a great place to promote your content, join groups, share ideas, find new hires, and build your brand with industry professionals. For most business owners building a following on each of these platforms takes time and requires significant nurturing, but all are potentially important tools for engaging with customers and prospects. Reaching local customers can be especially effective with influencer marketing, especially when those local influencers bring real local audiences to the advertiser or local business. It is tough for businesses to stand out from the crowd or to really know if you are reaching the right audience. This is where influencer marketing comes into play and where advertisers can leverage key local leaders, partners, or organizations to help them reach their targeted audiences. Here are some examples of how influencers can create buzz and public awareness with their followers about your business or local event - for example, new restaurant can encourage influencers (patrons), with strong local followings, to post photos of their meals on Instagram or write reviews online or on local blogs. When combined with other forms of advertising this technique of marketing can help get your message to an influential crowd get people’s attention. Out-of-home (OOH) or outdoor billboard advertising is a great way to create brand awareness and get people taking about your products and services. Common forms of outdoor advertising solutions include: billboards, advertising posters, wallscapes, transit - bus, taxi, and rail media, street furniture, specialty signage, digital, mobile billboards, and sports media. With billboard advertising, people are guaranteed to see your advertising, unlike commercials or ads that can be skipped on TV or viewed by robots on the internet. We are a nation on the move, and we spend increasing amounts of time outside the home the Outdoor Advertising Association estimates that 70% of consumer waking day is spent out of home. Outdoor advertising is the most affordable advertising medium on a CPM basis and is a great way to reach people where they live, work and play. Adding outdoor advertising to your media mix can increase overall campaign reach for TV campaigns by 18%, Web Campaigns by 68%, Social Media Campaigns by 212% and Mobile campaigns by 316%. Billboard advertising is sold by local operators like Atomic Billboards or on line through leading outdoor advertising platforms like Fliphound. Most traditional outdoor advertising still requires credit check or prepayment and online platforms require prepayment. "Out of home (OOH) media continues to deliver more online activity per ad dollar spent compared to television, radio and print (newspapers and magazines)." Use of these traditional forms of forms of advertising has been declining as more ad dollars shift to other ad mediums (primarily to digital and online advertising). TV and Cable advertising combine visual and audio for impact and historically have been the more expensive than Radio and other traditional mediums. Changes in viewing habits (how content is being consumed, e.g., on mobile phones), new viewing platforms (streaming Netflix & Hulu), having the ability to skip commercials with DVR technology, and fragmentation of audiences has allowed new mediums to emerge for advertisers who traditionally relied on TV commercials. Radio advertising remains less expensive than TV but its listenership has been in decline too. Technical advances has provided more listening options to audiences. Drive time listeners can now use mobile phones to access streaming services such as Pandora and Spotify. Both TV and radio audiences have the ability to switch channels, skip and/or block commercial something that cannot be done with outdoor advertising and billboards. All of these mediums have become more affordable over the last few years with increased competition and to accommodate new and smaller advertisers but remain more expensive than most of the advertising options we have highlighted. Advertising and marketing campaigns are important ways to promote your business so you will want to be sure that whatever form of advertising you choose fits in with business and marketing strategy. Because repetition is key you need to diversify your marketing efforts to reach your target audience. As advertising and marketing pros, we are constantly trying to attract and educate prospects for our clients and our own business. We, like many our customers, have tried a number of different approaches internally, with third party partners, and continue to gain insight on what works and what does not work. Many businesses have decided to outsource these efforts to a third party to manage your advertising campaigns, deal with the complexity of using different media, oversee social media activities and SEO optimization, but often the results are mixed. We have had similar experiences and have developed a new set of solutions that to increase our advertisers’ ROI. As all of you know we live and breathe out-of-home (OOH) advertising and continue to educate new advertisers about the effectiveness of the medium on a daily basis. We recognize the importance of incorporating digital, internet marketing, social media and outdoor advertising for our local clients. The impact of a well-placed outdoor advertising ad can be multiplied many times over through the use of internet and social media engagement. We have recently formed local partnerships, for advertisers and business who are serious about driving web, traffic, building their brands, and driving sales. Our combined platform, brings real local audiences to advertisers the minute they get started with a campaign with us. These solutions, initially launched in Wichita, Kansas, will allow advertisers to tap into and engage with real local audiences in many cases 10X the size of what they could get from traditional third party providers. This is something that we have never seen done in the OOH industry and includes a mix of billboard advertising, blogging, email, and social media. Forward thinking companies who are willing to make the advertising investment will be able to position their businesses and products with engaged and real local audiences almost immediately. Our online and offline partnerships are designed to give you access to the local audience want! If you are serious about accessing local audiences give us a call we can show you how our audience give you 10X the reach of our competition! Out-Of-Home and Billboard advertising has never been this easy.